1 What Is Teredo Tunneling Pseudo-Interface? 2 How to disable the Tunneling Pseudo-Interface? Windows is one of the most widely used desktop platforms in the world. It has millions of users who use this system every day to accomplish a lot of different tasks. Over the years, Windows has evolved a lot and with time the developers have made it more user-friendly. But, unfortunately not everything can go perfect and therefore several errors come up with time. One of the problems Windows users face is Teredo Tunneling Pseudo-Interface. Now, these problems need to be dealt with by the users. Have you faced such an error before? Yes? Then you must read this article because we will be discussing Teredo Tunneling Pseudo-Interface and how to solve it. 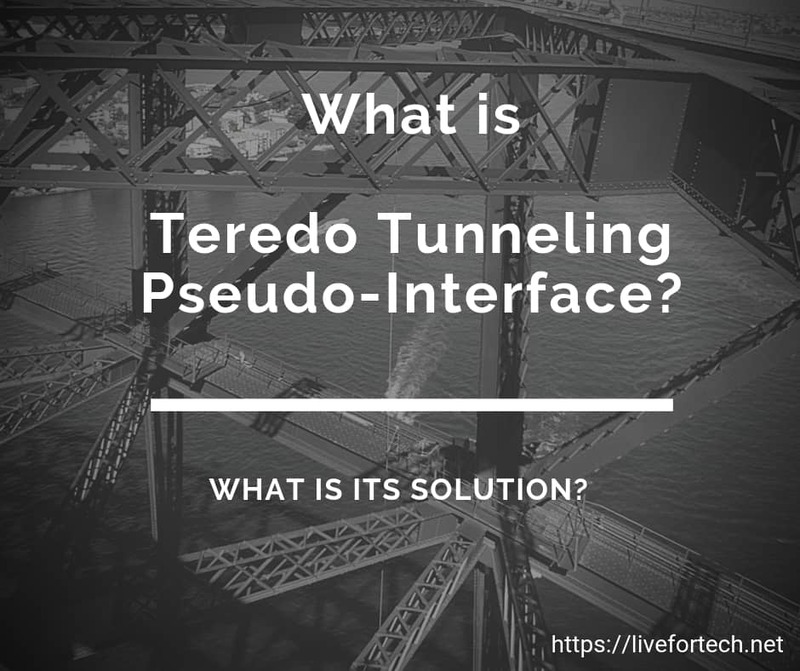 What Is Teredo Tunneling Pseudo-Interface? If you have not heard about this term before, then you must pay good attention to this section. The term Teredo Tunneling Pseudo-Interface is a kind of protocol which enables different computer systems behind a NAT firewall and which has no native IPv6 connection to obtain remote IPv6 resources. In simple words, the home users would be able to access the IPv6 web services even before their local internet connection supports this protocol which makes the changeover from the IPv4 much less difficult. Teredo Tunneling Pseudo-Interface was developed as a solution by a Windows 7 Ultimate user who found it out after carrying out a configuration in the command prompt. So, you are now able to access the IPv6 network when you are on an IPv4 network even though you are not authorized for IPv6. Here’s a post on How to remove acresso software manager? How to disable the Tunneling Pseudo-Interface? After a lot of research and exploration, developers have found out some effective ways of a fix by which they can solve this issue of Tunneling Pseudo-Interface. Let us have a look at those solutions in the section below. Press the Windows logo key and R simultaneously. Then type devmgmt.MSC and press Enter. Search for Teredo Tunneling Pseudo-Interface under category Network adapters. Then, right-click on Teredo Tunneling Pseudo-Interface and click Uninstall. If you see any other options related to it, uninstall them as well. Now, click Action at the top and Add legacy hardware and click Next. Click Network Adapter and select the Microsoft option on the left panel and Microsoft Teredo Tunneling Adapter on the right panel. Click on Next and you will be done. Using a third party application is probably much easier for many users to solve this issue. You can find different applications which will help you solve this problem. These applications automatically search for errors and faults in your system and will recover it by itself. Just search it up on the Internet and solve the Tunneling Pseudo-Interface problem which you are facing. If none of the above works, you can use the command prompt method. Type CMD in the windows start menu, right-click on it and Run as Administrator. There, type- netsh, int teredo and set state disabled. Remember to press Enter after writing each of these commands. Now go to Device Manager and expand the Network Adapter option. You will find the Tunneling Pseudo-Interface and uninstall it. Open the CMD and type in the commands we mentioned above once again similarly. Open Device Manager and click on Scan for the new hardware changes. So these are the few important and effective ways to solve the Tunneling Pseudo-Interface problem. The steps are easy to follow and carry out. We have mentioned all the steps required. Read the article carefully and execute each step carefully to get rid of the problem easily.